Vinification: All grapes are hand picked, which enables to select the best grapes. This is a major point in the quality of our wines. The grapes are pressed in pneumatic presses. The juice is clarified by cold sedimentation (10 – 12°) and a light fining. Fermentation happens at low and constant temperature (between 14 and 16°C) and lasts around three weeks. About a third of the volume is fermented and aged in French oak barrels. The other part stays in tanks on fine lees. Blend of both parts happens in Mai following the harvest. Our white Liracs are attractive when young in the year or two following the harvest, if you are looking for the wines to be fragrant, fruity and elegant but still can age for another four to six years. "Fresh, showing white peach, star fruit and yellow apple notes gilded with light fennel and honeysuckle accents. There's a kiss of toast through the finish. Drink now through 2019." 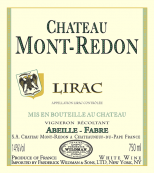 "A blend of Grenache Blanc, Roussanne, Clairette and Viognier fermented and aged primarily in tank, the 2016 Lirac Blanc reflects the firm's commitment to freshness in its white wines. Citrus zest aromas are backed by hints of stone fruit and melon, while the palate offers medium body, a silky texture and a dry, stony finish. Drink it over the next 12 months or so."